And whoopi is still on the mend. We’re hoping she’ll be back here soon, maybe next week. We’ll see. Hurry back, whoopi, and get better. Oh, my god! Oh, my god! Where are you sitting? Sit with you? Sit next to me. I think I have to do the show though. You sit here. I need the camera. Oh, my gosh. Sit in my chair. Sit in my chair. I tell you, we did not know — All: Whoopi, whoopi, whoopi, whoopi, whoopi, whoopi, whoopi, whoopi, whoopi, whoopi, whoopi! So after — I mean, I have to tell everybody that Brian kept his big bazoo shut for once in his life. No one told us — We don’t know what we’re doing. You should never live me again ever! You can’t leave the show. We missed you so much. We are shocked personally. I thought next week. So whoopi, how are you feeling? So, this is my first foray out. I am, you know, I’m not there yet, I know that. But, the only way it’s going to get better is if I begin, so this is my beginning. So I’ve — Makeup helps. Makeup helps. I still — I still have a cough and that’s the last thing to go apparently. But over the next week and a half I will start to be here more often, but I wanted the first foray to be to come see y’all because I really kind of missed y’all. I know, we missed you too. Every day we talk about how you’re on the mend and coming back soon. We missed you so much. My favorite thing — She almost went into labor just now. I almost went into labor. I think some people actually thought you had left because of trump. No, no, I think some people said to me, so, um, how did you get pregnant? And I couldn’t figure out what they were talking about. Then I remembered that you had said, you know, she’s on maternity leave. Right. You did joke about that. It’s sad that some people have no sense of humor. Well, I thought it was just — I was like, I actually — no, no. Eggs are gone. You look great. I think you lost weight. No, no, I’m the only person who can go into the hospital for three weeks and put weight on. Did you really? Yes. While you’re sitting I can’t tell. Can you say really though how scary this medical emergency I mean, it was very, very serious. Yeah, um, it was as — there’s death and here’s me. That’s how it was. So this is stuff that, you know, really for everybody, you know, you think you can push through because you got a little cold. You say, keep going, keep going. And you think because you’ve healed quick before that something crazy can’t happen. Well, it can. I had double pneumonia and sepsis, and so they had — Sepsis is dangerous. And double pneumonia will also kill you. So they had to pump a lot of stuff out of me. So, you know, this is a cautionary tale for all of us. You must really take care of yourself because there’s little tiny stuff out there that will kill you that you never think of. You know, puffy’s wife — Right. Died. Went from pneumonia. Yes. There are so many — When did you know because you were here and you had a cough for a week. When I was at the hospital. They took me to the hospital and the guy said to me, what color talking about my face because I was some weird color. And he touched me and said, this is not going to — he’s like, oh, 102, that’s not good. How did you know something was wrong? Because you called. I called — so I live in the middle of nowhere where I really like, and no one was home and so I called my work partner, Tom, and I said, I think I have to go to the hospital. Now, he’s in New York. He was here. He’s like, what? I said, yeah, I think you should call the ambulance for me. He said, you know I’m in new York right now? I was like, yeah. And so he called the ambulance and then we called Karen and my granddaughter came and all kinds of stuff. Karen is — Karen is makeup. You got to tell the story about Karen. So Karen is called and she literally leaps out of bed. Now, Karen is always Karen, okay? Karen. She’s a glamorous makeup When I tell you that she leapt out of the bed because she was asleep. She leapt out of the bed, got in the car. I don’t even know what she had on. She came to my house. They get me to the hospital. The doctors are trying to get blood out of me. They’re doing all kind of stuff and I hear — She’s putting makeup on you? Oh, my god. And I say, Karen? Because she’s in the next cubicle because they’ve separated her. I said Karen? She said what, baby, are you okay? I say to her, are you putting on your makeup and lashes? She said yes, baby. She said, I got a doughnut on my car and if the police stop me I got to look good. I mean, it was a lot — That’s funny. Can you share what the doctor said about your x-ray? Which one, the — The x-ray that he had never seen that before. Yeah. So, you know when you look at an x-ray, you see your lungs and stuff, and on the one he looked at, there was a really good looking lung and really clear like, I’m a lung. And then there was like this other thing where you should be able to see the diaphragm. It was nothing but white which meant there was stuff in there. So it was — this was like really bad. This was really bad. Was that the scariest moment looking back? No, the scariest moment was hearing my doctor say to me, you do realize how close to death you were? That was like, no, actually, I hadn’t thought of it. But thanks for sharing. He said you need to think of it. You need to be really clear about what this is. Well, you were coughing even from — November. From November you had been coughing and coughing. What’s your prognosis right now? The prognosis is I’m not supposed to be here but I got What are you supposed to be doing, stay in bed? No, not in bed. You just need to be upright and not be around a whole bunch of folks because you’re — Oh good. All right, shall we empty the house? No, because you’re suddenly now — my immune system is — Compromised. Yeah. So I’m supposed to just like — Ease back. Ease back in, and I will. Are you going to come in next week at all, do you think? Yes, I’m going to probably try to come in Monday. Do folks recognize you when you were at the hospital? So no. So here’s the crazy thing. So people come and they’re visiting — Bye, Karen. One of the women that comes into the room recognizes this one, but she’s not sure. Were you — yeah, it was these two. And she’s like — We all went to visit you. No, no, everybody went to visit but on this day that she’s talking about, this woman comes in and she’s doing stuff in the room and she says, you know you look like that lady from “The this one says, I hate that show. I never — I don’t watch that those women talk too much. And she looks over and says you look familiar too. She said, I don’t know, I’m not — I’m just me. I’m just me. The chicken farmer. And candy is there. Our EP. The EP. And she starts to sort of shoot this little video of the woman saying, you know, I like to watch that. She said I love that little Meghan McCain. I love all the ladies. They’re very nice. They’re smart. Sometimes they get a little loud. This one, yeah, but they’re too loud for me. It’s too much for me. And the woman goes on and on and on. Who did you say you were? I said I was whoopi’s cousin or something. Did she believe you? Yes. She did? For three weeks. You finally told her in the end. No, I didn’t see her again. Surprise. It was us. And I want to also — I want to thank everybody. I want to thank TMZ for not trying find me in the hospital. I’m thrilled that everybody kept the secret that I was in and that it was as bad as it was. You guys were great. They all came to see me at different times and, you know, it was a little hard. It was kind of scary and — scary for everybody but I’m here and I’m here to tell you we got to make some changes in our plans, and I’m going to say this really quick because I know you got to go. Oh, got to go now. Welcome back, whoopi. Coming back with more from whoopi. You want to hold the story? Okay, I’ll hold the store. We’ll be right back.right back.. We’ll be right back.y. We’ll be right back. We’ll be right back. Announcer: Tomorrow, what will happen when the governor of California, who just made big news by suspending the death penalty in his state, faces the women of “The view” live? And what’s his response to the president calling it a betrayal to victims’ families? Tomorrow he’s on “The view.”on “The view.” Ever notice how hard it is to clean impossible kitchen and bathroom messes with wipes and spray cleaners? Try Mr. Clean Magic Eraser. Just add water, squeeze, and erase. Mr. Clean Magic Eraser works great on burnt-on food in the kitchen. It’s perfect for cleaning stubborn bathroom soap scum. Even on glass. And it even removes four times more permanent marker per swipe. Try Mr. Clean Magic Eraser, for your impossible kitchen andbathroom messes. What patients don’t realize is what they eat and drink is likely acidic and then what’s happening is the weakening of enamel. Now is the perfect time for a toothpaste like the new Pronamel Repair. This toothpaste takes it to the next level. It takes minerals and it drives it deep into the tooth surface so that we can actively help repair weakened enamel. I do think dentists are going to want to recommend the new Pronamel Repair toothpaste. It’s such an easy answer and it will do exactly what their patients need. With Advil, you’ll ask… What sore muscles? What pounding head? Advil is… Relief that’s fast. Strength that lasts. You’ll ask… What pain? With Advil. ??? ??? We all care abouamazing taste. That’s why we’ve been making the best mayonnaise for over 100 years. Hellmann’s. We’re on the side of food. A whole new way to care for newborns is born. Johnson’s cottontouch??? wash and lotion, made with real cotton, and enhances your gentle touch. A new soft, a new touch, a new gentle. Johnson’s cottontouch???. Choose gentle. Hurry back, whoopi, and get well — Oh, my god! 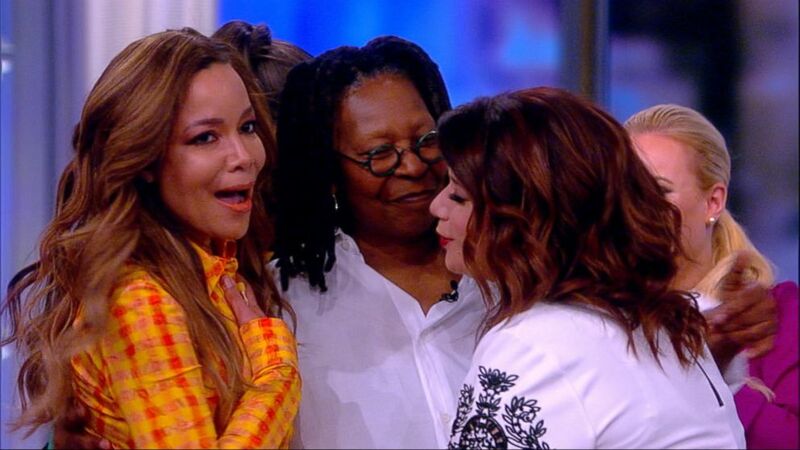 That was whoopi surprising all of us. We had no idea she was coming back.